Coupon Crazy Mommy, along with our sponsor AJs Collection-Personalized Jewelry to Remember, is proud to announce the Mother’s Day Giveaway! Special “Thank You!” shout outs go to my Co-Host Three Boy Circus! You can see the review of this awesome jewelry here. 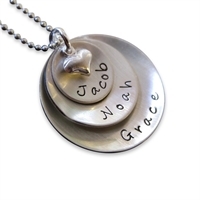 Personlized Jewelry is so popular right now! I love these necklaces. I am so happy to bring this giveaway to my readers! Enter below to win a $75 Gift Card to purchase this fabulous personalized jewelry for yourself!